Now in its seventh year, Art After Dark integrates various art forms on the museum grounds, introduces children to MMoA’s programming, and provides regional artists a forum to showcase their work. Weather permitting, the event is held on the MMoA patio. 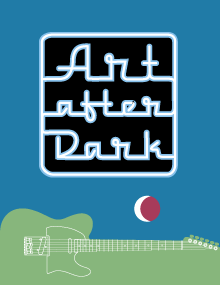 August’s Art After Dark will be held from 6-830pm on Tuesday, August 15. Combining rock, reggae, pop, and country, The Fake Experience will headline August’s concert. The band features Gus Glaza on bass, Shawn Fake on drums, Todd Fake on guitar, and Bethany McGill on lead vocals. Veterans of the local scene, The Fake Experience performs a mix of covers and originals that has generated a devoted following. Sam Brown is the artist behind the long-running interactive art project explodingdog, which has been featured in publications from The New York Times to Wired. He lives in West Hartford and is the author of Sometimes I Forget You’re a Robot, a picture book published by Dial Books for Young Readers. April Brunelle began making balloon art in 2010. She enjoys using her creativity and artistry to generate balloon sculptures. In addition to Art After Dark, she performs at Fusion and the Mudhead Benefit Regatta. Oct. 17, The Mill and Russ Kramer. During the event, MMoA galleries remain open to view current exhibitions: Robert Brackman: Thinking in Color, a display of works from the permanent collection and loaned works; The 61st Regional Show; and, Fans and Vessels: The Works of Janvier Miller. Art After Dark sponsors include: ABC PhotoLab, A Greener Perspective, Capt. Daniel Packer Inne, CMB Creative Group, Coca-Cola, Cottrell Brewing Co., Dogwatch Café, Hosmer Mountain Beverages, A Greener Perspective, Market Realty, Mystic Shipyard, Mystic River Mudhead Sailing Association, Noank Village Boatyard, Pizzetta, Sails Up 4 Cancer, and The Real McCoy Rum.